Fiji Airways' new MD Stefan Pichler has begun work on the development of a five-year strategic plan which will build on the airline’s new branding and structure and seek to increase connectivity through codeshare and interline agreements to grow Fiji’s tourism industry. With the transition from Air Pacific to Fiji Airways almost complete and the last of three A330-200s due to arrive in Nov-2013, management attention has turned to the domestic and regional Pacific Island subsidiary Pacific Sun which has also completed a restructuring over the past three years and is likely to receive a fleet upgrade to accommodate expected market growth. Mr Pichler said in his first week in the job that Fiji Airways is in a pivotal period of growth and change. “The combination of a strong brand, new fleet of A330-200s and refurbished Boeing 737s, as well as improved schedules and services opens up an exciting new chapter for the airline”. Mr Pichler takes over from Dave Pflieger who left the carrier in May-2013 after leading a major three-year strategic review and restructure of Fiji Airways including rebranding from Air Pacific back to its 1960s' name in Jun-2013 to realign the airline with its home market. Mr Pichler arrives fresh from four years as CEO at Jazeera Airways where he has been credited with implementing a remarkable turnaround plan which saw the Kuwait Stock Exchange-listed carrier return to profitability, including achieving the highest operating margins in the industry of 25% in 2011 and 30% in 2012. Prior to Jazeera Airways, Mr Pichler spent five years at Virgin Blue in Australia as CCO at a time when the carrier was transitioning from a LCC to a “new world” network model, eventually becoming Virgin Australia after his departure. He also was part of the launch of the group’s long-haul operation V Australia in 2008 and was its chairman until Jun-2009. Mr Pichler had been regarded as a possible successor to Virgin Blue founder Brett Godfrey, a position that was eventually taken by current CEO John Borghetti. Mr Pichler, a former internationally ranked marathon runner, has a strong pedigree in the aviation and tourism industries which should stand Fiji Airways in good stead. As chairman and CEO of Thomas Cook AG, Mr Pichler built the company from a national German tourism operator into the world’s second largest leisure group. He has also held senior and executive board roles with Lufthansa including marketing and sales manager for France in 1989, MD of Lufthansa France in 1991, MD for Lufthansa Germany in 1995 and executive VP of worldwide sales and marketing in 1996 and finally was appointed to the Lufthansa executive board in 1997. He had also been active in a number of travel related organisations. Mr Pichler has stated that Fiji Airways’ new five year plan should be completed by the end of 2013. The plan will outline strategies for network growth, fleet and maintenance, as well as options to improve the carrier’s partnerships with other airlines through codeshare and interline agreements. Fiji Airways has existing codeshare agreements with Qantas, Air New Zealand, American Airlines, Alaska Airlines, Cathay Pacific and Solomon Airlines. One possibility is to develop the existing interline agreement with 46% shareholder Qantas for Australian domestic access beyond Sydney, Melbourne and Brisbane into a more comprehensive codeshare agreement. The relationship between Qantas and the Fiji Government, which owns 51% of Fiji Airways, has been strained since the Government issued a contentious decree requiring Fiji citizens to comprise two-thirds of the board. Faced with having to give up one of its four directorships, Qantas elected to withdraw all four in May-2012. The situation is further complicated by Qantas’ desire to sell its stake to the Fiji Government, but the Government considers the USD70 million asking price too high. One thing Mr Pichler is not keen on is sparking a capacity and price battle with Australian carriers on the core Australian routes. Fiji Airways has suffered at the hands of Virgin Australia and Jetstar which have used their lower cost bases to take a near 50% market share on the Australian routes in recent years. Instead the strategic focus is on using Fiji Airways’ new and refurbished fleets to develop continuous tourism growth from the Australian market which accounts for a little over half of Fiji’s total visitor numbers. “We don’t want to have a market share battle. The market is pretty much in a good state and a good place for all competitors there and we don’t necessarily want to shake it up,” Mr Pichler told The Sydney Morning Herald. Fiji Airways currently operates about 9,000 one-way seats per week across 24 frequencies to three points in Australia, Sydney, Melbourne and Brisbane. 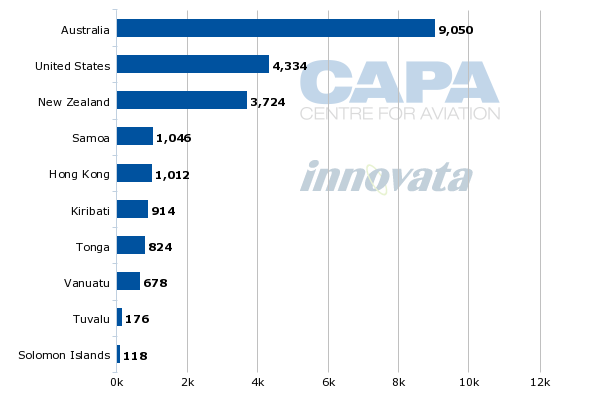 This is equivalent to the combined capacity deployed to the United States and New Zealand as the second and third largest markets during the week from 16-Sep-2013 to 22-Sep-2013, according to Innovata. An additional frequency was added to the Nadi-Sydney route in Sep-2013 taking the service to 14-times weekly and this will increase to up to 17 times per week at peak times. Melbourne will also increase from five times weekly to six per week in Dec-2013 as the final A330-200 comes on line and the remaining 747-400 exits the fleet. Brisbane is currently served up to eight times per week. 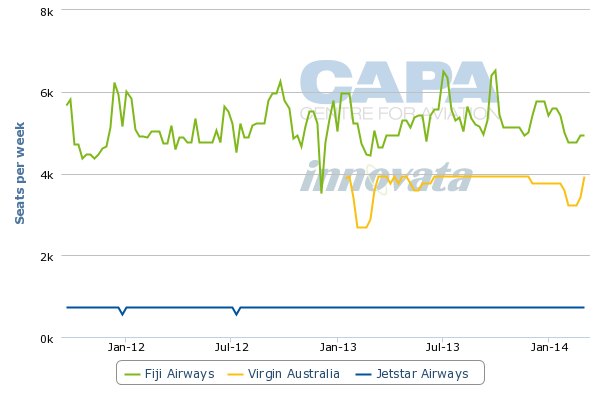 Overall, Fiji Airways currently has a 53% share of capacity on the Fiji-Australia route compared to nearly 40% held by Virgin Australia and just over 7% by Jetstar. But growth on the route is being restricted by a lack of available capacity permitted under the bilateral agreement between Australia and Fiji which is now fully taken up. This will need to be reviewed when the agreement expires in 2016. Frequencies have also increased on Nadi-Los Angeles in Jul-2013, while Hong Kong services will move to three times weekly from twice weekly in Jan-2014. With the rebranding from Air Pacific to Fiji Airways, along with transition to the new long-haul fleet being almost complete, attention has turned to modernising the short-haul fleet operated by 100% subsidiary Pacific Sun. Pacific Sun conducted its own operational restructuring in tandem with the Fiji Airways relaunch programme, including network and fleet optimisation. The airline signed a letter of intent with Singapore-based aircraft leasing company Aviation PLC in Jul-2013 for a 12-year operating lease of a new ATR 72-600. Delivery of the aircraft is scheduled for Apr-2014, subject to the signing of a formal contract, on which there has been no update. Pacific Sun intends to use the new aircraft to operate routes between Fiji’s larger domestic centres including Nadi, Suva and Labasa, as well as on regional international routes to Tuvalu, Kiribati, Vanuatu, Samoa and Tonga, which it currently operates on behalf of Fiji Airways with two ATR 42s from Suva. The ATR 72-600 will provide Pacific Sun with greater fleet flexibility. The ATR 72-600 will join Pacific Sun’s current fleet of two ATR 42-500s and three DHC-6-300 dating back to the 1970s which operate between Fiji’s main and outer islands. Mr Pichler has indicated in local media that the ATR fleet operated by Pacific Sun will be reviewed after the last A330 arrives, with a probable upgrade as part of the five year strategic plan. The intention to acquire larger aircraft was based on Fiji Airways’ confidence in the growth of the domestic and regional market. However, Mr Pichler reportedly is concerned that the larger 68-seat ATR 72 should not lead to an oversupply in the market. Growth in the domestic market has been relatively flat for the past year with capacity ranging largely between 6,000 and 7,000 one-way seats per week, according to Innovata data. Mr Pichler has inherited an airline that has come through a comprehensive review and restructure that has returned the formerly ailing Air Pacific into the profitable Fiji Airways of today. His job is now to build on this solid foundation and grow and diversify the carrier’s route network and in the process Fiji’s all important inbound tourism market which is over exposed to Australia. Obvious targets are the rapidly growing demand from China and the recovering United States market where codeshare partner American Airlines provides extensive feed traffic. The other challenge will be dealing with Fiji’s unpredictable political environment, no small task, notably also where the situation with part owner Qantas will need to be resolved sooner rather than later. Additionally there is increasing competition on the trans-Pacific routes and neighbouring Pacific Island countries vying to attract one stop leisure traffic looking to break the long-haul flight between the United States and Australia or New Zealand with an island getaway.